As we approach a well-earned break for the end of Term One, I would encourage everyone to read (or listen!) to some recent releases. The Senior Library has an extensive collection of e-audiobooks and e-books and every boy has direct access these collections via the Borrow Box app or the library webpage. 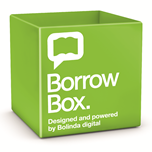 To access the collection, either download the green BorrowBox App from the App Store, or follow the link from the Senior Library webpage. There are some great titles available and boys may borrow up to four titles for two weeks each. Before the end of term, boys should also endeavour to confirm with their teachers the content they will be covering when Term Two commences. This week is the perfect opportunity to seek advice on recommended prepared readings. While the upcoming break is an ideal opportunity to have some downtime, it is also a great way to plan and get prepared for upcoming work requirements. Enjoy a safe Easter break. St Hilda’s and TSS Philosophy Club … 10th June @ TSS. Topic for discussion is ‘Conformity’.